The grey Nylon PA11/12 (grey plastic) objects printed through Sculpteo are created from a fine grey polyamide powder, more commonly known as nylon. The material is both solid and flexible, unlike some of the other materials offered by Sculpteo. Grey PA11/12 (grey plastic) is great for both experienced professionals and beginning designers because of its high precision and low cost. Unpolished, the material is white, granular, and somewhat porous - these options can be further refined with Sculpteo’s in house polishing processes. It is also possible to polish and paint your objects at home using material-specific techniques. 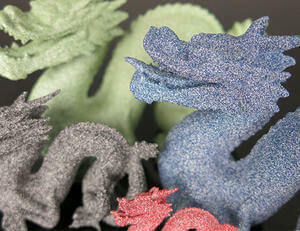 To learn more, refer to our paragraph about finishes and colors for polyamide models. The printing price of your design is calculated automatically the moment it is placed online. As you modify your object (changing size, using batch control or hollowing feature, etc.) you will note that the price changes automatically. The pricing is based on a series of factors, including: total volume, object size, and bounding box - to name a few. Your grey Nylon PA11/12 (grey plastic) object is estimated to arrive in 4-8 business days. Polishing, painting and particularly large objects can extend the processing time by 1-2 days on average. The estimated shipping time is also calculated automatically as the object is uploaded. SLS uses a highly specific laser that sinters thin layers of grey polyamide powder together one layer at a time. After each round of lasering, the printing bed is lowered and another layer of powder is evenly swept across the top for another round of sintering. This process is repeated at a layer height of 100 µm until the object is completed. After the printer cools, the block of sintered grey powder is removed from printer and the printed objects are removed by hand. A part of the grey powder that was not sintered is recycled back into the printer for a future print. The object is then brushed, which removes a large portion of the grey powder, and sandblasted, which removes the fine grey powder that the brush may have missed. From there the object can be polished depending on the color you chose. Our polishing technique involves small stones in a rotating/vibrating cauldron - as the stones brush up against the object, small imperfections in the surface are smoothed. To learn more, refer the paragraph on finishes for grey polyamide models. 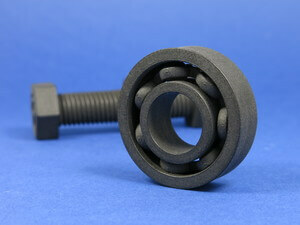 Grey Polyamide offers great flexibility when 3D printing, especially complex models, as it is flexible and durable. As a result, the objects in this material have a wide range of uses from mechanical (prototypes, geared systems, articulated objects, etc. ), ornamental, or even educational (bone structures, etc.). Technical properties of grey polyamide change depending on the thickness of your model. With a 0,8 mm wall thickness, your model will be flexible. With a 2 mm wall thickness, it will be rigid. With regards to water qualities, grey polyamide is water-resistant but not waterproof. Thus the 3D object must not rest in contact with water for extended periods of time. In terms of temperature, if the grey Nylon PA11/12 (grey plastic) is subjected to heat above 120°C (248°F), it is possible that the physical form of the object can significantly altered. The somewhat rough surface of grey polyamide objects can attract dirt. This can often be remedied with soapy water and a cloth, letting it dry thoroughly. The objects are coloured throughout their whole volume, which makes them resistant against scratches and abrasion. There are multiple finishing options available through Sculpteo. 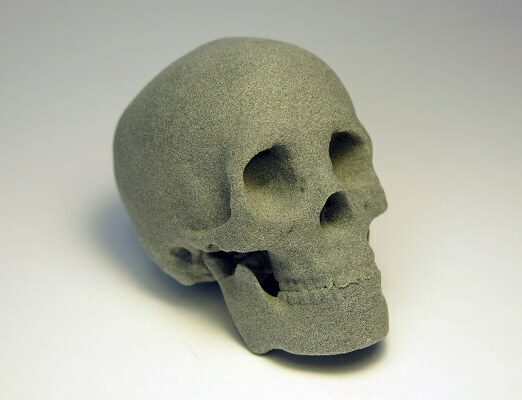 Raw: sandblasted but unpolished, surface remains somewhat rough, most economical. Polished: polished through mechanical polishing, smoother to touch, layers still somewhat visible on rounded objects. Your grey polyamide part is made from a grey polyamide powder. This grey polyamide powder is a mix between white polyamide powder and black polyamide powder. As as result, the part is coloured throughout its whole volume. This is a different process than the other plastic colors offered on the website for polyamide since other colors are dyed (except for black Nylon PA11 parts). It is also possible to arrive at finer levels of finishing at home with various DIY techniques. To learn more, you can refer to our tutorial about gluing and painting polyamide models. Our 3D printer for the grey Nylon PA11/12 (grey plastic), the EOS P395, gives us a layer precision of 100 µm (0.10mm). The maximum size of your models are limited by the physical size of our 3D printers - nothing can be printed larger than the printer bed. The same goes for our polishing tanks - if it doesn’t fit, it can’t be used. There is no minimum size for polyamide prints, keeping in mind minimum thickness for walls and structural aspects, to ensure the object will not break is 0.8 mm. The walls of your design must adhere to a minimum thickness of 0.8 mm in order to guarantee the structure will not break. If the walls of your model are less than 0.8 mm, you can to add a support structure to maintain stability. A stemmed element is a design aspect which is at least twice as long as it is thick. For unsupported and stemmed elements or parts of the design with a particular design constraint, it is also important to respect a minimum thickness of 1 mm in order to guarantee the object will not break. Add a support structure to maintain stability. For example, if you are modelling a bust of a person, you can attach thin aspects of the design like the ears in more places around the model’s head. Doing that will avoid cantilevered and easily breakable elements in the final print. With a 0.8 wall thichness, your design will be slightly flexible. To obtain more rigidity, we advice a 2mm wall thickness. Thin walls supporting large, heavy Nylon PA11/12 plastic models can warp under the weight of itself. Sculpteo offers an online solidity check tool which highlights parts of the print that may be too thin for a print. From there you are able to tweak your design in order to create an object that is an appropriate thickness. To use it, you just need to upload your 3D file , select your material and clic on “Verification” tab. It is also important to keep in mind that the object is to be printed into real life. Thus if a thin aspect is supporting something that is too heavy for it, it may break - even though it is possible within the physics provided by your 3D modeling software. We recommend adding a bit of thickness to the places that will get a lot of handling, or that support the most weight. A detail’s minimum precision is mainly determined by the resolution of our 3D printers. However, during the cleaning process, a fine layer of detail can also be lost. In order for a detail and text to be visible we recommend following our recommended sizes at the very least. It’s possible that particularly fine embossings and engravings will not be visible, as the carving could get filled with excess powder that is later unable to be cleaned out. If an embossing or engraving is an essential part of your design we recommend making them as deep as possible. To ensure a better powder removal (thus a better detail visibility), the width of your details must be at least as big as depth. 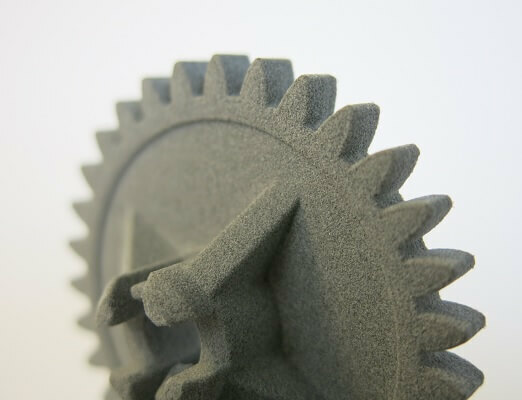 Our grey Nylon PA11/12 (grey plastic) material has the ability to print the most complex designs of our materials. An example of a complex design is a volume enclosed within another volume, like a chain or maraca. Our 3D printers have the ability to 3D print a fully interlocked chain our of the printer, with no support structures to remove. For a successful 3D print a minimum clearance between objects is required to allow excess material to be sand blown out. If this space is not left within the design, the object will be a solid. This is particularly important for articulated objects - as the space left between the walls will define the object’s ability to move. Clearance should be at least 0.5 mm and depends on your objects size. For big sizes, the clearance should be greater. The heated zone of your object depends on the size, the larger the object the more time it will be exposed to high temperature : if the space left between the walls is too small, it will be weld because of heat spreading. In some cases, holes should be added to allow us to drain for the excess powder material within the clearance. Clearance should be at least 0.5 mm, however that is the minumum for small objects. Larger objects require more space between their parts. This is due to the SLS printing process. Our printer beds are heated during the process, and larger objects are heated for longer periods. A small space between larger objects runs the risk of melting together as it remains under heat for a long period of time. In some other cases, holes should be added to allow us to drain for the excess powder material within the clearance. 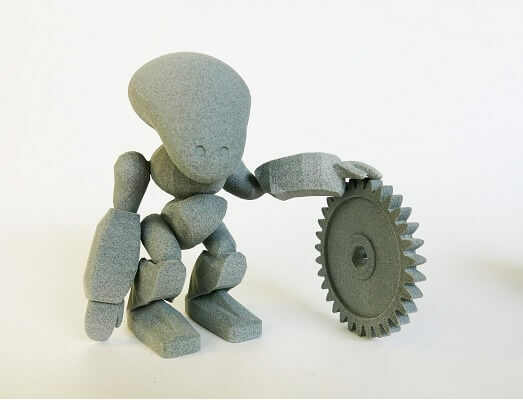 Objects printed in grey polyamide can be printed to be assembled. As long as a width of at least 0.5 mm is left between the different parts of the object. Our online hollowing optimization tool has the ability to greatly reduce the price of a print by reducing the amount of material used. Using the tool requires adding two holes to your model, which will serve as the drain for the excess powder material within the object. The minimum size of these holes is determined by our website. Otherwise it is possible to hollow your object manually in your 3D modeling software. 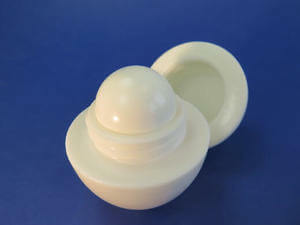 It is not possible to 3D print a 3D file containing several objects with our 3D plastic printers.